Helen Lewis’ hair started to thin in her mid-20s and caused her to lose job interviews, social life and confidence. Eight years ago, having tried everything without success, she heard about Lucinda Ellery. 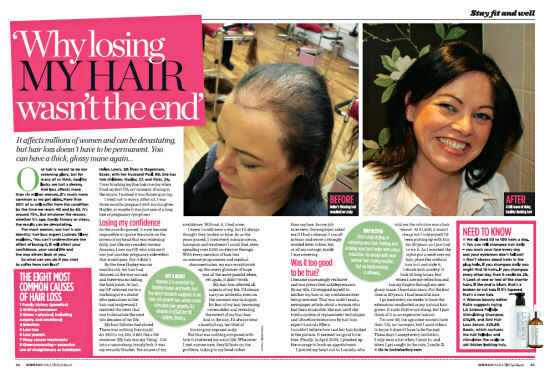 Here she talks to Woman magazine about the problems she faced and the difference it’s made having hair again. Our hair is meant to be our crowning glory, but for many of us thick, healthy locks are just a dream. Hair loss affects more than six million women. It’s much more common as we get older. More than 50% of us will suffer from the condition by the time we reach 40 and by 65, it’s around 75%. But whever the reason, whether it’s age, family history or stress, the results can be devastating. So what can you do if you start to suffer from hair loss? Helen Lewis, 50, lives in Dagenham, Essex, with her husband Paul, 50. She has two children, Hayley, 27, and Vicky, 24. I was brushing my fine hair one day when I had my first ‘Oh,no’ moment. Staring in the mirror, I noticed that I was thinning on top. I tried not to worry. After all, I was three months pregnant with my daughter Hayley, so maybe it was just one of a long line of pregnancy symptoms. As the months passed, it soon became impossible to ignore the circle on the crown of my head that was widening daily, just like my rounded tummy. Anxious, I saw my GP, who told me it was just another pregnancy side-effect that would pass. But it didn’t. By the time Hayley was six months old, my hair had thinned all the way around and there was no hiding the bald patch. At last my GP referred me to a trichologist - a doctor who specialises in the hair and scalp - and I received the news that was to devastate the next two decades of my life. My hair follicles had closed. There was nothing they could do. Still in my 20s, it felt like a life sentence. My hair was my ‘thing’. Cut into a razor-sharp trendy bob, it was my security blanket, the source of my confidence. Without it I had none. I knew I could wear a wig, but I’d always thought they looked so false. So as the years passed, I tried every miracle cream, hairspray and treatment I could find, even spending over £250 on electric therapy. With every mention of hair loss on science programmes and medical documentaries, my ears would prick up. But every glimmer of hope was all the more painful when, yet again, it didn’t work. My hair loss affected all aspects of my life. I’d always carry an umbrella, even on the sunniest day in August, for fear of my hair becoming rain-sodden and revealing the extent of my hair loss. And in the sun I’d always wear a baseball cap, terrified of burning my exposed scalp. But that was nothing compared to how it shattered my social life. Whenever I met anyone new, they’d fixate on the problem, talking to my head rather than my face. In one job interview, the employer asked if I had a disease. I ran off in tears and wrote a strongly worded letter to him, but for all my outrage, inside I was cowering. I became increasingly reclusive and was prescribed antidepressants. By my 40s, I’d resigned myself to neither my hair or my confidence ever being restored. That was until I read a newspaper article about a woman who had been miserable, like me, until she tried a system of replacement techniques and ultra-fine extensions by hair loss expert Lucinda Ellery. I couldn’t believe how real her hair looked in the picture. It seemed too good to be true. Finally, in April 2005, I plucked up the courage to book an appointment. I poured my heart out to Lucinda, who told me the solution was a hair ‘weave’. At £1600, it wasn’t cheap but I told myself I’d been putting up with this for 20 years, so I just had to try it. As I watched the stylist put a mesh over my hair, place the artifical hair in it and style it, I shook with anxiety. It took 10 long hours, but when I saw my reflection and ran my fingers through my new glossy mane, I burst into tears. For the first time in 20 years, I had beautiful hair. I go back every six weeks to have the extensions readjusted as my natural hair grows. It costs £120 - not cheap, but I just think of it as an expensive haircut. I’m 50 now, the age some women have their ‘Oh, no’ moment, but I want others to know it doesn’t have to be the end. These days I accept every invitation, I only wear a hat when I want to, and when I get caught in the rain, I smile.